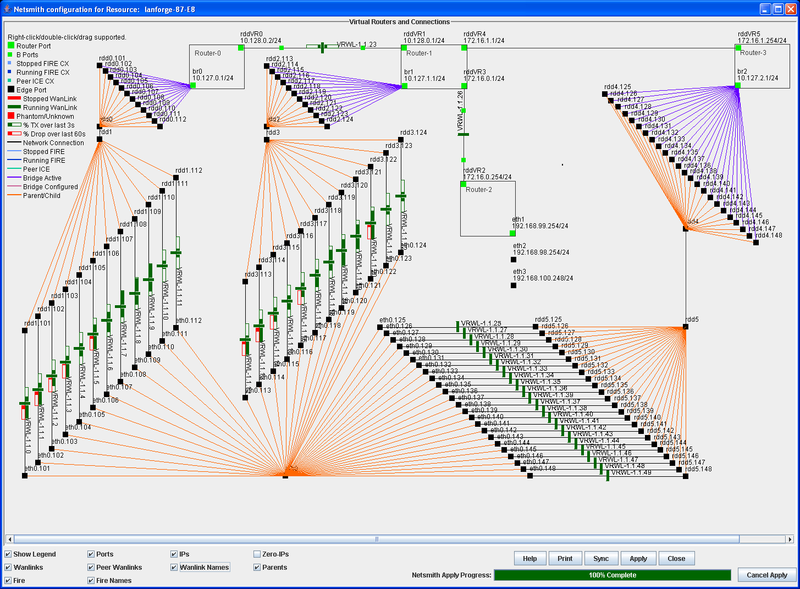 Some users may want to simulate an entire LAN or WAN network. LANforge ICE supports this with its Netsmith feature. Netsmith is a click-and-drag virtual network builder. It supports Bridges (switches) including spanning tree protocol, as well as OSPF, BGP, RIP and multicast routers. IPv4 and IPv6 routing protocols are supported, and the bridge will handle any Ethernet frame. LANforge is running real router and bridge software, so it can exchange messages with external equipment to populate routes and set up spanning trees. A screenshot from a Netsmith virtual router & emulation setup is found here. LANforge ICE is often customized to a customer's specifications. In particular all of the LANforge FIRE Network Traffic Generation feature set is available. Some standard systems are listed below, but please contact sales@candelatech.com to discuss your requirements in detail and for a customized quote.